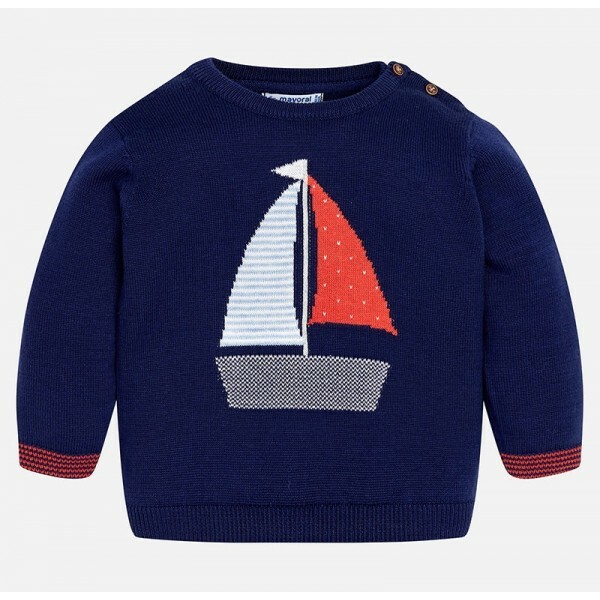 We really love this one, and so will your little sailor. Beautifully designed by Mayoral, the smart navy blue jumper has a striking sailboat interwoven into the front, all made in finely knit pure cotton. Soft, lightweight and effortlessly stylish, it's a piece that will always be the first one out of the wardrobe this summer. The sailing motif is a really unique design feature that takes this piece to somewhere completely out of the ordinary. It's a great go-to for when warm summer days turn to cooler evenings. It's a jumper you can easily mix and match for either smart or casual wear.